After driving from the Big Island’s dry southeast shore through volcanic dunes, created when fine sand blown by trade winds piles up, we begin to appreciate the unique topography of this youngest and largest of the Hawaiian islands. Unlike Kauai, which has had millions of years to stabilize (no volcanic eruptions) and bloom into a tropical paradise, the Big Island of Hawaii continues to evolve. Rising gases are a result of volcanic activity. Five volcanoes make up the land mass of the Big Island. Kohala on the northern tip is the oldest; Mauna Kea at more than 13,000 feet is the tallest, and Mauna Loa is the largest by sheer volume. An active volcano, it erupts about every 25 to 50 years (last eruption was in 1984). Kilauea, home of legendary volcano goddess Pele, has been erupting continuously for more than 30 years with new lava flows that started in summer 2014 threatening to devour more roads and homes. This landscape was recognized for its historic and geologic significance and became Hawaii Volcanoes National Park, the United States’ 13th national park, in 1916, even before Hawaii was a state. Our tour arrives at Jaggar Museum, and we observe glowing displays of red-hot lava in the crater there. 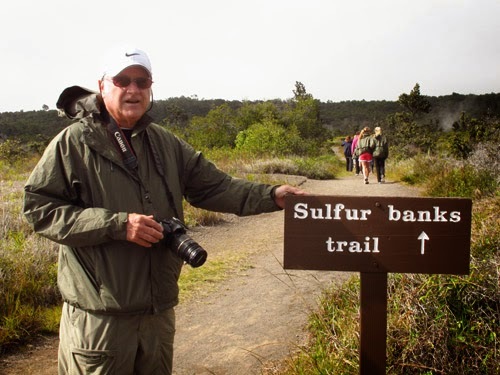 We walk steamy Sulfur Banks Trails filled with craters bubbling up strong- smelling sulfur dioxide gas. Then we drive the winding Chain of Craters Road where magma swells and forms a rift along which eruptions occur. A 36-mile round-trip drive, Chain of Craters Road descends 3,700 feet to the coast and ends at a 2003 lava flow. The volcanic rift is easily seen in this photo. 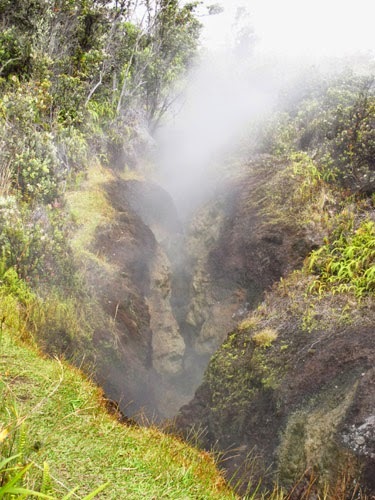 The caldera is easily accessible by car, which provides an excellent opportunity to see flowing lava. Since the lava’s path changes constantly, check with the Kilauea Visitor Center to get the latest report on where to see this. 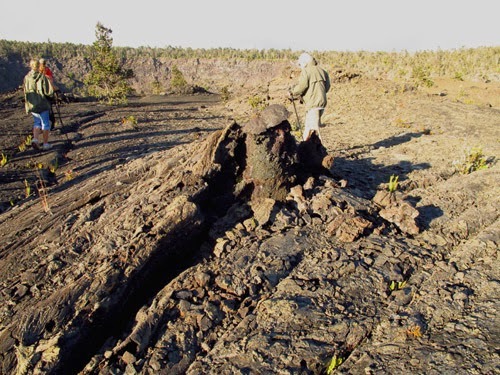 Nate, our guide leads us to a remote area where we walk carefully on what resembles a moon scape, dusty and drab and jagged, to see the aftermath of the eruption of Mauna Ulu. Hills and small craters cover the area, and it’s very windy and chilly in late afternoon. But it’s such an unusual scene that we are glad to experience it. Spotty patches of vegetation creep in ridges as plant life adapts to this most improbable place. Even where it’s dry, the so-called fog drift provides much needed moisture. At sunset, Nate drives to his secret place where we dine in semi-darkness. He has planned a treat and invites us to follow him down a path, clutching flashlights and jackets against the night chill. Many tourists go to Jaggar Museum to witness what we see close-up in the dark sky--a brilliant red plume rising from the ground. We’re standing beside an active lava display, all the more spectacular for the darkness that surrounds us--—the crowning glory of our tour . flow. No reconstruction has taken place here. 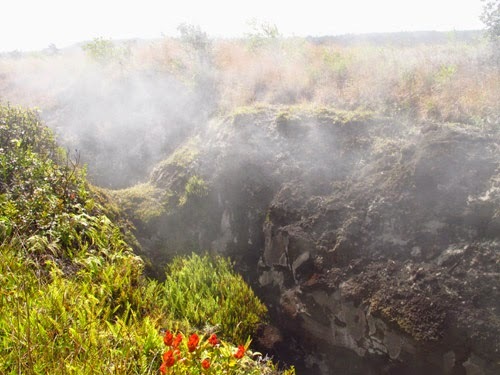 The gate to Hawaiʻi Volcanoes National Park is open 24 hours every day. 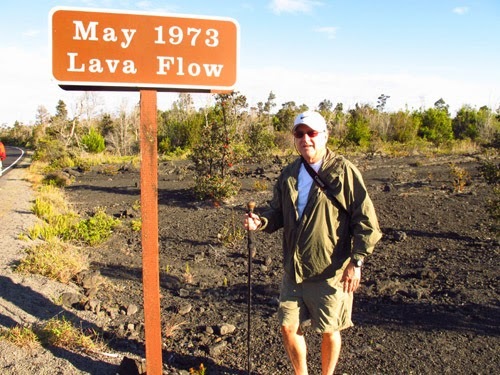 There is only one entrance to the park as the eruption from Kilauea from that began in 1983 blocked the other entrance. Since the eruption continues today, the road hasn’t been repaired leaving a 10-mile gap where vehicles cannot drive.